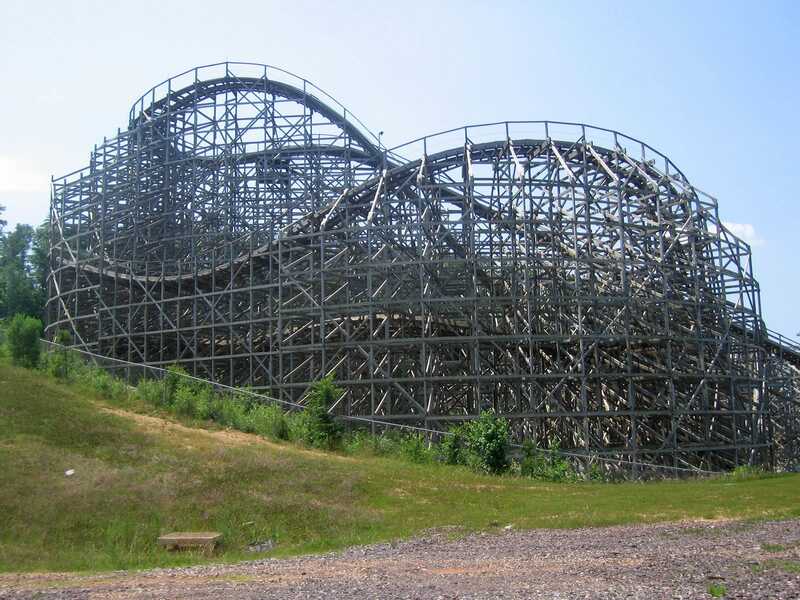 Coaster trips are invariably planned with the full knowledge that the occasional ride will be down. However, in an ideal world, the one you end up missing would be somewhere a little more on the beaten track than in Alabama Adventure. We arrived at the park to discover that the CCI-built wooden coaster, Rampage, was having a singularly bad day. One of the sensors on the brake run was misbehaving, resulting in a complete ride shutdown every time the single operational train arrived there. The operators were initially optimistic, projecting a twenty minute delay, but this ballooned over time to the point that they were estimating three quarters of an hour after the point which we had set as an absolute cut off for driving to the airport. This would not have been a problem were it not for the wonderful people at Delta Airlines. My plans had called for a mid to late afternoon flight out of Birmingham, AL, and I had booked accordingly. Unfortunately, though I had a confirmed reservation, some weeks before the trip I received an e-mail from Delta moving me to an earlier flight. It seems that my original flight had been overbooked, as it was still shown on the airport schedule. The net result was that we lost two planned hours in Alabama Adventure, and there is little doubt in my mind that that two hours would have been ample to ride the offending coaster. All we had left were the diabolically bad Zoomerang (#761), without question the most uncomfortable Boomerang I have ever been on, and the kiddie ride, Marvel Mania (#762). The latter was actually moderately rerideable, but as with any such ride one circuit is ideal to limit the embarrassment caused when five year olds ask their parents why there are big people on such a small coaster. Every dark cloud has a silver lining. My changed flight gave me a four hour layover in Atlanta. While Hartsfield-Jackson is not the worst airport to be stuck in, spending that much time in a transfer lounge is something to be avoided if at all possible. More to the point, a certain well known Six Flags park thirty minutes up the road had just installed a brand new B&M, which was tantalisingly close. I sent out a request around the ECC mailing list, and my friend Hector was kind enough to offer me a lift to the park. The ride in question was, of course, Goliath (#763), one of two new B&M mega coasters to open this year, and the first in four years. The long absence is best explained by cost; twenty million dollar attractions are well outside the budgetary constraints of the average park, and those that can afford them can only make investments of that size on an occasional basis. 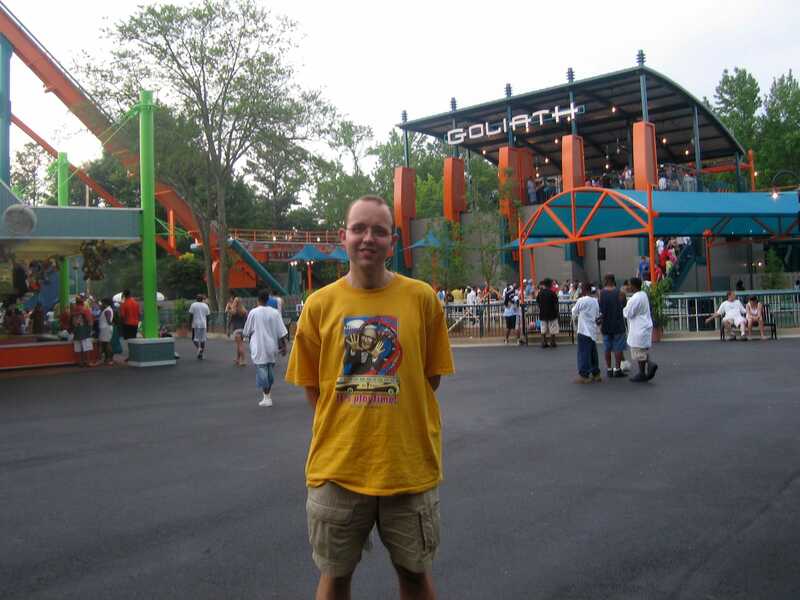 The only possible way to get in a ride on the coaster in the short time available was with a Gold Flash Pass, a park sanctioned method of line jumping. The basic premise is that those who are willing to pay an extra charge, over and beyond the already expensive entry price, can have their waiting time drastically reduced. Ethical considerations aside, this pass meant that we were on the coaster platform just ten minutes after arriving in the park, and on the ride itself just five minutes later. The line for normal guests had to have been at least one hour long, which made walking past it more than a little embarrassing. As it happened, we were just in time. The sky had gradually been getting darker during our fifteen minutes in the park, and Hector suggested we should ride as single riders just in case. As it was, Hector's train had just arrived in the brake run when the operators announced the closure of the ride due to weather conditions. Moments later, the park was drowned in a singularly impressive thunderstorm, of the sort one only ever sees in the United States. Reriding being thus utterly out of the question, we made it back to the airport just over two hours before my flight. So was it worth it? Without question. Of the rides of this design, I still consider Raging Bull to be the best of the lot, but this one is probably tied in second place with Apollo's Chariot. The ride spans quite a large area of the park, and provides the signature attraction that up until this year was absent from the park. Perhaps the park could run a promotion in conjunction with the airport, offering additional flights during long layovers? Admittedly Superman suits the flight thing a little better, but the airtime is far superior on the new ride.